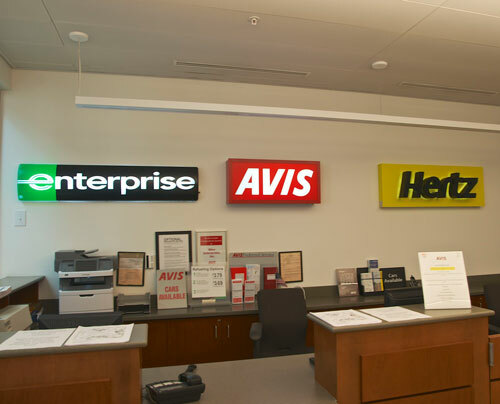 You can find many car rental companies at all major US airports. However, this is not the case for all airfields, where, if there is a rental car company, it will usually be AVIS, Hertz and, most often, enterprise. If requested, car rental companies frequently drop the car off at the airfield and pick it up there later which makes renting a car pretty easy. An FBO (fixed base operator) employee will take care of the keys. But this means that you have to arrange for your car in advance. Many FBOs make courtesy cars, sometimes also called a crew car, available to guest pilots. These vehicles can be used free of charge for a short period of time, usually between one and two hours. You are generally expected to have your plane refueled during this time. This is a courtesy because the employees at the FBO frequently lend the vehicle out without charging anything, usually as a gesture of hospitality. Remember, the FBO is a company trying to make money and is under no obligation to give anything away for free. So keep that in mind when you are offered this fantastic service!